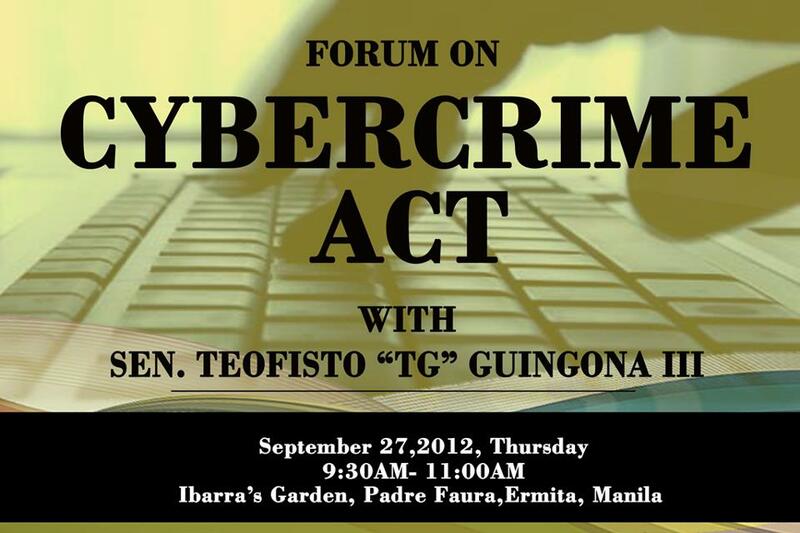 Cybercrime Prevention Act of 2012: Demonizing The Online Critics | Pinoy Alert ! In the first place, I just don’t get it why it was signed in the first place. The public, or at least our government top leaders should have studied this law first before it was presented to the public. Not the other way around. It’s not as easy as spitting a meal that’s bad to our taste. Puking isn’t even nice! Why do they need to feed us this trash then later they seem to express that we have a choice to vomit it out if it doesn’t go well in our stomachs. Now, I just hope the good Senator TG Guingona is dead serious in going after the perpetrators of this “rushed” Republic Act (RA 10175), and has the capability to stop the implementation of this law, well at least the Libel provision. 1. It is vague – “First, without a clear definition of the crime of libel and the persons liable, virtually any person can now be charged with a crime.” Indeed, it ain’t very clear who will be liable enough to be charged with this crime! It tramples on our freedom to express by causing fear that we might be called a criminal just by ranting out our frustrations. 2. It is unfair – “While libel committed through traditional print media is punishable by up to 4 years and two months of imprisonment, online libel is punishable by a shocking 12-year imprisonment period.” Mama Mia! So, it means the online detractors are more evil than the mainstream media detractors? How come? Is it because we could easily hide behind anonymity by using alias or nicks? Is it because its more difficult to trace us so they would require a bigger budget to pinpoint who we really are? 3. 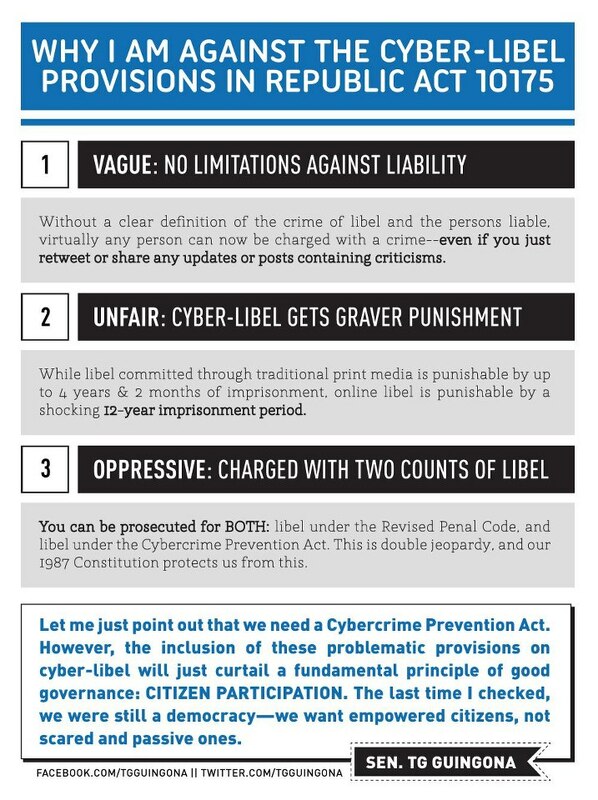 It is oppressive – “You can be prosecuted for both libel under the Revised Penal Code, and libel under the Cybercrime Prevention Act.” Talk about double jeopardy. It’s mean and downright cruel! Two accounts of criminal intent charged to an individual whose main concern is only to “echo” out his or her grievances online, where unlike rallying on the streets, is the more humane thing to do. And for whom is this law anyway? Who would really benefit from this law? I don’t think an ordinary citizen would dare spend his hard-earned money running after the people who “cursed” and “belittled” him online. I would like to think only the “powerful”, “influential” and “affluent” would benefit from this law, and more specifically the libel provision! To the ordinary citizen. “The problem is not just the threat of jail time and/or fine. The bigger threat is the cost of defense!” To sum it up in just one sentence. Who are they fooling? There was news that this libel provision was inserted at the last minute by the “immature” Senator known as Sotto. All because he has tasted the harsh realization that his “plagiarism” would be easily detected by the now more “critical” eyes of the “adoring” public. 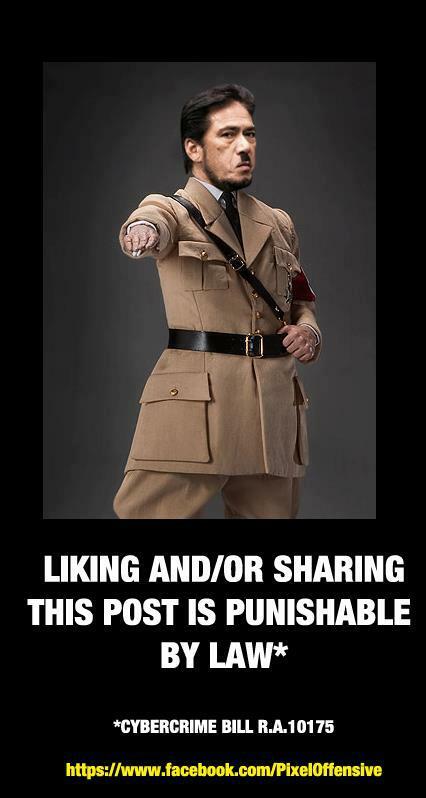 He got a whipping of cyber justice (or bullying as he says). We know for the fact that this was what he meant when he said during his Senate speech that there would be a law to stop the likes of “bloggers lang” and critics that was hot on his every move. Its very obvious why this law was signed. Its reason is crystal clear. Its meant to deter us from becoming overzealous and exaggerated. Its meant to keep us anchored to the ground by a chain tagged as the “libel provision”. The government realized that the power of social media could no longer be tamed and controlled, it let out a watchdog provision to guard and bark on us, with its sharper teeth and claws, ready to jump in on us when we make a sudden annoying and threatening move. …Did I mention an election is nearing? Well, that sums it all up! I rest my case!